Agricola marched into the North of Scotland in AD 79, but did the Romans come as far as Moray? Recent Treasure Trove items allocated to the Museum have added a new dimension to the debate. Elgin Museum has been awarded "Recognition" Status for its internationally renowned Fossil Collection. New and exciting multi-period archaeological finds are coming up from the Burghead area. Watch this space for more information being added to the ever-growing history of Moray. We now have the 'Birnie Hoard' on loan from the National Museums of Scotland. This superb hoard of Roman coins and artefacts adds to the unfolding story of the Romans this far north into Scotland. You may also want to look at our fine collection of Pictish Stones or our unique Elgin Reptiles. Pre-Columbian pottery, Scotland's only Currach - these are some of the surprises you will find. This award-winning Museum, founded in 1836, houses important collections of Natural History, Geology, Archaeology, Science, Art, Ethnography and Social History. 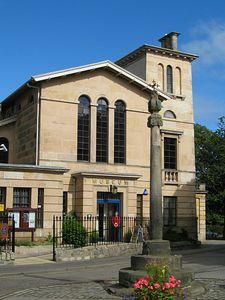 Elgin Museum is not just about collections. The changing exhibitions which try to show much of the Museum's treasures may be complemented by activities, workshops, conferences and courses. School and group visits are welcome and junior and senior clubs meet to discover the natural and human heritage of Moray in an informal way. Object handling sessions are available for schools throughout the year. Real artefacts can bring your project to life. Geology, Early Man, the Victorians, Roman in the Gloamin and other aspects of the school curriculum are catered for. Other group visits welcome - tours with tea and coffee, talks also given about the Museum. The permanent exhibition entitled "Victoriana" is also well worth a visit.